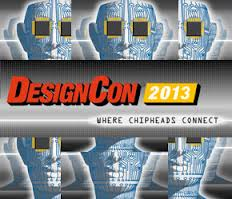 DesignCon 2013 will be held January 28 through 31, 2013 at the Santa Clara Convention Center in San Jose, CA. The expo portion is on the 29th and 30th. Registration is open now with free expo passes, and reduced conference fees, which are available for a limited time. This is the conference created by engineers for engineers. DesignCon enables chip, board and systems designers, software developers and silicon manufacturers to grow their expertise on the latest theoretical design techniques, methodologies and applications, learn about emerging design tools, and network with peers and industry experts. Conference highlights include over a dozen tracks for designing from chip level through to system level. Some featured sessions topics are: Modeling (EM, High Speed Interconnect, Analog / Mixed Signal and Power Distribution), Rapid Prototyping, FPGA development / coding, Board layout / simulation, and Power Consideration. In addition to the conference, there is a vendor and developer expo. The semiconductor and electronic design engineering communities look to the DesignCon Expo Floor as THE place to discover the latest advanced products, technologies and developments in the industry. If that isn’t enough to get you there, keep in mind there are the after hours networking / mixer events, the industry award show and prizes/ give-aways. Industry luminaries will be on hand to meet with conference attendees and give their insights on the industry. Bill Swift, Vice President of Engineering will be the luncheon key-note speaker on Monday 28 January 2013. On Tuesday, Jonah Alben, Senior Vice President GPU Engineering, NVIDIA will address the lunch attendees. Wednesday’s speaker is Mike Santori, Business and Technology Fellow at National Instruments. Wednesday will also have an “Ask The Experts” panel discussion with: Eric Bogatin (Bogatin Enterprises), Jeff Loyer (Intel), Lee Hill (SILENT Solutions LLC), Steve Weir (IPBlox), Jim Nadolny (Samtec), Don DeGroot (CCN Labs). Use the DesignCon 2013 Mobile App for a complete list of exhibitors, attendee directory and to personalize your schedule for the conference. To register, or for more information, go to the DesignCon 2013 homepage. If you found this article interesting and informative, please be sure to sign up for our weekly e-newsletter as well as daily email / RSS Feeds.